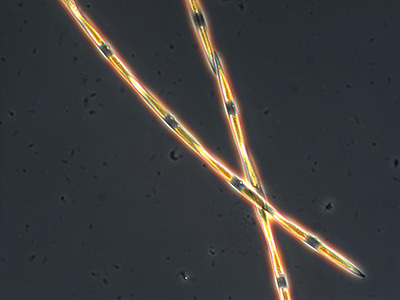 Pseudo-nitzschia diatoms produce the neurotoxin domoic acid. An extensive bloom of toxic algae along the West Coast has waxed and waned since it first appeared in early May, but it hasn't gone away. Now well into its second month, the bloom extends all along the coast from Santa Barbara to Alaska. In Alaska, the algal toxin domoic acid has reached levels never before seen that far north, according to Raphael Kudela, professor of ocean sciences at UC Santa Cruz. "It truly is an unprecedented event," said Kudela, who holds the Ida Benson Lynn Chair in Ocean Health at UC Santa Cruz. "It's doing very strange things along the whole West Coast of the United States." The bloom involves the proliferation of Pseudo-nitzschia diatoms, a type of microscopic algae, which produce a neurotoxin called domoic acid. This has forced the closure of shellfish harvesting and other fisheries along the West Coast to prevent humans from being exposed to the toxin, which causes amnesic shellfish poisoning. The toxin is also affecting wildlife, including sea lions and fish-eating birds such as pelicans. The videos above are from an interview with Kudela conducted on June 19, 2015, in his lab at UC Santa Cruz. Kudela explains the conditions that have made the current bloom so extensive and long lasting; what its impacts are on people and wildlife; and what his research team is doing to study it and to predict future harmful algal blooms.